Hippocrates, Greek physician (469-399 BC) recommended the use of horse riding to "regenerate health and preserve the human body of many ailments , especially the treatment of insomnia." Asclepiades of Prussia, Greek physician (134-40 BC) believed that horse riding was beneficial for patients with gout, epilepsy, paralysis, stroke, lethargy and frantic. It was also prescribed by Galen, Greek physician (129-199). It was mentioned by Jerónimo Mercuriales, Italian philologist and doctor (1530-1696). Thomas Sydenham advised riding for tuberculosis, biliary colic, and flatulence. Friedrich Hoffman, chemist and German physician (1660-1742) considered the horse´s walk as the healthiest gait. Denis Diderot, French philosopher and writer (1713-1784) said that horsemanship stimulated the movement of muscles. Horsemanship was also advised by Johann Wolfgang von Goethe (1749-1832), Joseph Clement Tissot French physician (1750-1826), Giuseppe Benvenuti (Italian physician) and Charles Marie E. Chassaignac (French physician (1805-1879). 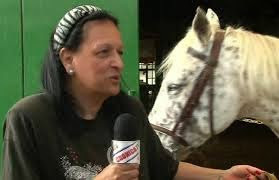 In Argentina, the Argentine Association of Equestrian Activities for the Disabled (A.A.A.E.P.A.D) was founded by Mrs. Maria de los Angeles Kalbermatter more than 35 years ago. She was a pioneer in Argentina together with centers in Brazil . It has 250 disabled students of all ages and pathologies and works with an Interdisciplinary Team of Health and Education Professionals of more than 20 people. · Therapeutic horseback riding uses a therapeutic team, usually including a certified therapeutic riding instructor, two or more volunteers, and a horse, to help an individual ride a horse and work with it on the ground. · Hippotherapy involves an occupational therapist, a physiotherapist, or a speech and language therapist working with a client and a horse. Different movements of the horse present challenges to the client to promote different postural responses of the client by the horse influencing the client rather than the client controlling the horse. The word "Hippotherapy" is also used in some contexts to refer to a broader realm of equine therapies. · Equine-assisted learning (EAL) is described as an "experiential learning approach that promotes the development of life skills ... through equine-assisted activities." · Equine-assisted psychotherapy (EAP) does not necessarily involve riding, but may include grooming, feeding and ground exercises. Mental health professionals work with one or more clients and one or more horses in an experiential manner to help the clients learn about themselves and others, while processing or discussing the client's feelings, behaviours, and patterns. The goal is to help the client in social, emotional, cognitive, or behavioral ways. Other terms for equine psychotherapy include Equine-facilitated psychotherapy (EFP), equine-assisted therapy (EAT), Equine Facilitated Wellness (EFW), Equine Facilitated Counselling (EFC) and Equine Facilitated Mental Health (EFMH). · Interactive vaulting involves vaulting activities in a therapeutic milieu. · Therapeutic carriage driving involves controlling a horse while driving from a carriage seat or from a wheelchair in a carriage modified to accommodate the wheelchair. 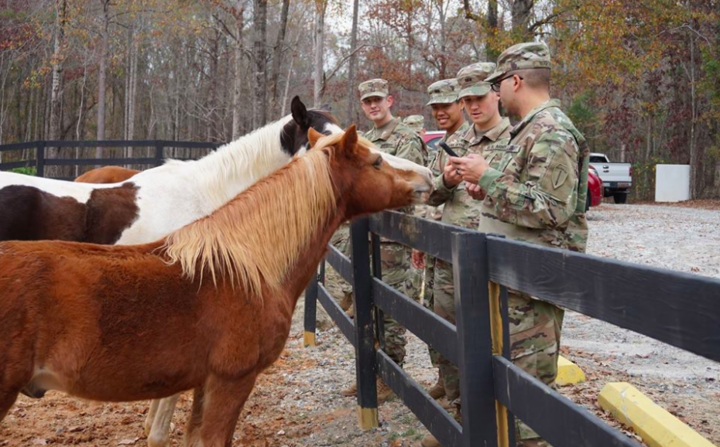 · Equine-Assisted Activities (EAA) incorporates all of the above activities plus horse grooming, and stable management, shows, parades, demonstrations, and the like. The specialist in equinotherapy observes and interacts with the patient identifying their patterns of behavior, thoughts and emotions. Many of the benefits noted are due to the nature of the animals. Horses do not judge, they do not have expectations or preconceived motives and they reflect in a very effective way the attitudes and the human behaviors. The specialist in equino therapy observes and interacts with the patient identifying their patterns of behavior, thoughts and emotions. Many of the benefits noted are due to the nature of the animals. As horses are large and powerful animals, they can be intimidating. For some people, this presents them with a challenge as soon as they start therapy - to overcome this fear. Combating this initial issue can be incredibly liberating and helps to boost feelings of confidence and self-esteem. Accomplishing tasks and gaining the trust of such animals only continues to reinforce these feelings of empowerment. Horses are herd animals, which means they naturally desire company and often want to be led. This makes them very social animals that want to create bonds - and this can be especially poignant when it comes to humans. Horses are therefore ideal for this type of therapy, as they will be inclined to develop a relationship with you when you are ready. Another reason horses are used is because they have an innate ability to mirror the thoughts and behaviours of others. Because they are prey animals, they can read body language and respond instantly. This means that if you enter the horse’s space with a negative attitude and defensive body language, chances are the horse won't want to interact with you. Alternatively, if you enter with a sense of calm, confidence and openness - you should find the horse responds more positively. It is this trait that helps you to reflect on your behaviour and challenge the way you approach situations both inside and outside of your therapy session. Sergeant Major Sam Rhodes of the US Army He returned in 2005 after 30 months of combat in Iraq with the diagnosis of PTSD. According to the US Department of War Veterans, 11 to 20 percent of soldiers returning from Iraq and Afghanistan have PTSD. Argentine Association of Equestrian activities for the disabled . -María de los Angeles Kalbermatter-Asociación Argentina de Actividades Ecuestres para Discapacitados A.A.A.E.P.A.D. Pionera en Argentina y Latinoamérica desde 1978. 1-Asselin G, Penning JH, Ramanujam S, Neri R, Ward C. Therapeutic horse back riding of a spinal cord injured veteran: a case study.- Rehabil Nurs. 2012 Nov-Dec;37(6):270-6. doi: 10.1002/rnj.027. 2-Barolin GS, Samborski R.- The horse as an aid in therapy.- Wien Med Wochenschr. 1991;141(20):476-81. 5-Cramer, Tom-Veterans conquer depression with Equine Therapy-Veterans Health Administration-May 23, 2017. 8-Esposito,Lisa- Equine Therapy: How Horses Help Humans Heal. 9-Kate V, Wilmarth MA. Hippotherapy: A Therapeutic Treatment Strategy [Internet]. Physical Therapy CE, Jobs, and News at TodayinPT. com. [citado 2011 Jul 21. 10-Koca TT, Ataseven H. What is hippotherapy? The indications and effectiveness of hippotherapy.- North Clin Istanb. 2016 Jan 15;2(3):247-252. doi: 10.14744/nci.2016.71601. eCollection 2015. 11- McKinney JM, Hirsch JK, Britton PC. PTSD symptoms and suicide risk in veterans: Serial indirect effects via depression and anger. J Affect Disord. 2017 May;214:100-107. doi: 10.1016/j.jad.2017.03.008. Epub 2017 Mar 7. 12- Pérez Álvarez L, Rodríguez Meso J, Rodríguez Castellano N. La equinoterapia en el tratamiento de la discapacidad infantil. Revista Archivo Médico de Camagüey. 2008;12(1). 13-Schultz Ramos de Andrade, M. Control motor y equinoterapia [Internet]. En: I Congreso Brasilero de Equinoterapia. Brasil: [citado 2011 Jul 20]. p. 6.